How's it going with your Sniper Squads? And more importantly: are you ready for the soon to be introduced A.I.M. Bot? Maybe, you're just asking yourself what to watch on Twitch this weekend? Or are you curious what a tournament winner has to say? Many questions this Friday and we cannot answer them all. But we can try, so let's get started! According to Jarvo, this is the first tournament he ever hosted but maybe not the last one. He might be hosting bigger tournaments in the future, according to his stream yesterday. This Saturday, we will see no group stage, but a Double Elimination final stage with the Conquest format. Here you go for the official announcement. 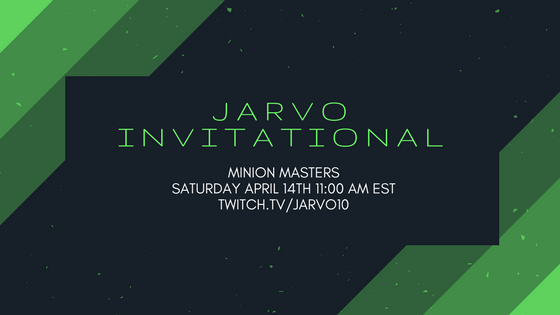 We advise you to follow Jarvo on Twitch already, to make sure you don't miss the show! 2nd King Puff Cup tournament of Season 3 announced! On Saturday, April 21st at 13:00 UTC, we will see the next King Puff Cup tournament of Season 3! The King Puff Cup staff didn't hesitate to announce the next tournament earlier this week. According to the official announcement on Reddit, the tournament will be played with the exact same rules and formats as the first tournament. The official announcement, the rules, all the information you need and the sign-up link can be found right here! Don't know what this is all about? Here's the latest tournament video on Twitch. Surprisingly, even for himself, katt won the first tournament of King Puff Cup Season 3. He wasn't very active in the tournament scene before, but his name is definitely known from the Top 20 leaderboards in-game. We asked him some questions and are happy that he took the time to answer them. Hi katt, nice to have you! Would you please introduce yourself real quick? Hello, katt here. I was introduced to Minion Masters back in early 2017 and I believe my story of coming across it to be quite different and funny. I was actually gifted the game from a guy who thought I was a girl and I’m thankful he did since I had no idea about the game. Well, I gave it a try and was pleasantly surprised by how much I enjoyed it, as I mostly played shooter games in the past. Roll on a year and a bit and it’s now one of my favorite games to play. You’re a regular Top 20 player and we saw your performance in the last King Puff Cup. That was really impressive. Could you explain to our community how you approach games and what your secrets for success are? First and foremost it’s about having a good time, so I approach games in a light-hearted manner. While I do like winning, approaching it in this way takes off the pressure and stress of always wanting to win. This personally, gives me a more enjoyable time. I like building all kinds of decks, sometimes involving underused cards or Masters and then experimenting with them. They may not be viable in all situations, and that’s fine as long as it’s fun to play. But to pin down a few tips for building a competitive deck is to include minions which you are able to defend and push forward with, while also re-taking bridges, to not fall behind in experience for essential perks. In short, with a well-balanced deck, it’s easier to defend in a mana-efficient way, which gives room for nice counter-pushes. No other participant brought Milloween to the last King Puff Cup. What do you think are the reasons and why did you bring her? Well, personally I don’t have a lot of experience playing Milloween, so I’m not confident with her. I haven’t seen her commonly played by others either, so I assume they may think the same as me - which could be why no one else brought Milloween to the tournament. Speaking for myself, I didn’t participate with the intention to win. I decided to try something new and since Milloween was reworked not too long ago, I wanted to see how she fares against the top tier players. I think it’s an interactive Master with its’ perks, and designing a deck around Arcane Golem can prove to be effective. Back in Season 2 of the King Puff Cup, you weren’t very active in the tournament scene. Will that change now in Season 3 and after your recent success? It’s true I wasn’t very active in the previous seasons. Rather than being a participant, I’ve been more of a spectator. However, this will likely change as I want to be more active in the tournament scene because the games are just so much fun. katt, how do you feel about the state of Minion Masters in general? I can see that there’s work being done by the Devs. They are working closely with the community and it’s nice to see feedback being acknowledged and implemented into the game. For example, quite a significant addition, where the community was involved was the card design contest. This involvement of the community shows how much the Devs value their players’ ideas. I also appreciate the fact that this game is real-time based, meaning that timing is crucial and the tide of the game can change dramatically, which highlights the importance of decision making. An issue many point out is Demon Warrior’s mechanic, that the minion is either too weak or overpowered when played many times. Obviously, this can be countered, but in my opinion, it relies too much on designing an entire deck which can beat a single card. Overall, I feel like Minion Masters is in a pretty good state right now with potential to be even better. With new cards being added and existing cards modified if necessary, each to have their own purpose, the future can be very interesting. I expect there to be continuous improvements as the game matures in which I’m excited to see. The follow-up question: where do you see Minion Masters in 2 years from now? Recently, most of the talk that’s been going on is about pushing Minion Masters into the eSport scene. Hopefully, in 2 years time the hard work from the Devs will pay off and that there'll be a growing presence of Minion Masters in the eSport world. Also, I expect the community to grow as time goes on. In that case, it’ll be harder for the Devs to make adjustments from all of the feedback, but I don't think it's that much of a concern. There's a passionate team working behind the game, so I'm confident that they'll be able to see the most meaningful and helpful feedback in continuing to develop the game in the right direction. katt, it was a pleasure to have you! Thanks for your time and if you want, leave some shout-outs. Thank you for having me! First off, I would like to give a shout-out to 3FFA and Eazotop for being very nice and helpful since my early days in the game. A shout-out to The King Puff Cup staff and casters, who have done a great job. Also, one to my favorite Minion Masters streamer, videogamer7777777_91, who always puts on a good show, particularly when facing Dragon Whelps! Not to forget, a big shout-out to the responsive team behind BetaDwarf. They deserve all the credit they can get.